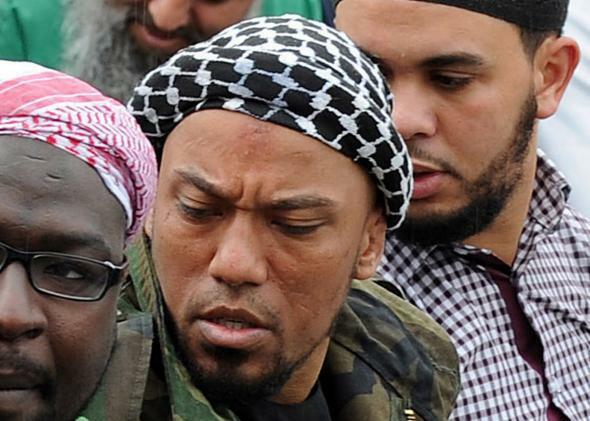 Deso Dogg: Former German rapper Denis Cuspert is an ISIS terrorist, State Department says. Former German rapper Denis Cuspert, aka Deso Dogg, center, in 2012. The U.S. State Department has designated a German rapper an international terrorist due to his work as a “willing pitchman” for ISIS, including an appearance in a recruitment video holding a severed head, NBC News reports. The 39-year-old, who grew up in Berlin’s Kreuzberg district, began his career as a rapper in 2002. In 2007, he declared himself a committed Muslim, and was linked to Berlin’s Al-Nur Mosque by 2010. He moved to Egypt in mid-2012, and German authorities believe he joined the Syrian civil war last April. Intelligence officials consider that Cuspert’s place in Germany’s alternative culture gives him “considerable capacity for reaching radicalized persons in Germany.” His main mission appears to be to mobilize radical Salafists in Germany to join the “Islamic State,” through German-language propaganda videos. When an anti-ISIS video claimed to show Cuspert’s dead body in 2012, a statement attributed to him said he was still fighting Assad’s government forces in Syria. His latest appearance on screen to promote ISIS surfaced in November, though it was not clear when the video was shot. NBC notes that the State Department’s decision to designate Cuspert a terrorist suggests that American officials believe he is still alive and actively participating in the conflict, while weekly newspaper Die Welt am Sonntag reports that he is under investigation for possible war crimes in Germany. Cuspert’s journey from Berlin to Syria has parallels with the story of L Jinny, a West London rapper who emerged as part of a group of British fighters in Syria known as “the Beatles” and is suspected to be the masked man who murdered journalist James Foley on film. L Jinny has maintained a social media presence from the battlefield, revealing that the two rapper-warriors share an affinity for posing with severed heads.